Now that the Oscar nominations are out and the guilds (as well as groups like the Golden Globes and BFCA have announced) are underway, the race is starting to take shape. Or, in the case of this season, taking a left turn and changing the race entirely. This weekend, The Big Short bested BFCA winner Spotlight, Golden Globe winner The Revenant and Mad Max: Fury Road for the Producers Guild Award. This is the biggest get of the season leading up to the Oscars and now puts the film firmly in frontrunner status. The PGA hasn’t missed a Best Picture correlation in eight years. The last time it missed was in 2007 when Little Miss Sunshine won the PGA but The Departed won the Oscar, along with Martin Scorsese’s long overdue Director win. In that year, Valerie Faris and Jonathan Dayton were not nominated for the Best Director(s) Oscar. Interestingly enough, this was the end of a three-year run of the PGA and the Oscars not aligning. The Big Short and Mad Max: Fury Road won the ACE Eddie Award for Best Edited Comedy and Drama Feature, respectively. The Screen Actors Guild award for Outstanding Cast in a Motion Picture went to Spotlight and that means we have an Oscar race again! Now, The Big Short‘s PGA win still trumps a SAG cast win but it does make The Big Short‘s hold a bit less strong. As does Christian Bale’s SAG loss to someone who isn’t even Oscar nominated (Idris Elba). Spotlight and The Big Short both take the WGA awards for Original and Adapted Screenplay, respectively. The Revenant, Mad Max: Fury Road and The Martian all won their respective categories with the Art Directors Guild (ADG) and all are nominated for the Production Design Oscar. Star Wars: The Force Awakens, The Revenant and Mad Max: Fury Road all won at least one award from the Visual Effects Society (VES) but only the latter two are Best Picture nominated. 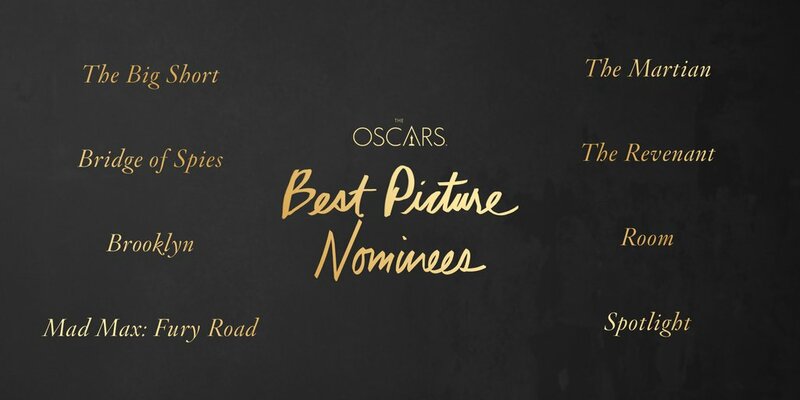 No film since 1970 has won the Visual Effects Oscar without a Best Picture nomination when there is at least one film in that category that is. Star Wars: The Force Awakens won the top award but is not Best Picture nominated. Alejandro G. Iñárritu wins the DGA for the second year in a row and now he and The Revenant become top tier frontrunners. The Revenant won the Cinema Audio Society (CAS) award for Sound Mixing, beating out Oscar competition in Mad Max: Fury Road, Bridge of Spies and Star Wars: The Force Awakens. Here is the breakdown of the race for Best Picture based on guild support. Placements are subject to change as more guilds announce. Included are nominations with WINNERS in bold.